Home Brands The Breville Coffee Maker: Is It the Right Choice for Your Kitchen? The Breville Coffee Maker: Is It the Right Choice for Your Kitchen? It’s no secret that America runs on just about any cup of joe that they can get their hands on. That's why it's boring and annoying having to go through multiple coffee machines just to get your caffeine fix in the morning. Enter the Breville Coffee Maker, a coffee machine that promises, delight, aroma, and rich tastes all in a cup of joe. Is the Breville coffee maker really worth giving up your daily manual pour? What Is the Breville Coffee Maker? Should You Purchase a Breville Coffee Maker? With an affordable price tag, an adjustable inbuilt burr grinder, and a capability of brewing up to 12 cups of delicious joe, the Breville coffee maker might be your ideal buy. The manufacturer through its products offers a variety of ways to tinker with these possibilities. It’s fast, has temperature control capabilities that parachute this midrange product into a territory occupied by the likes of Behmor’s brewers. So, what really makes this coffee maker an ideal buy? Breville is one of the most reputable appliance manufacturers in its market, and its coffee maker machines range is no exception. The manufacturer produces several premium coffee makers that tend to justify its steep prices with an extraordinary range of capabilities and features. Not forgetting its airtight build quality. Breville coffee makers are for individuals who desire good quality coffee without having to bother with buying multiple gadgets. With the Breville coffee maker, users don’t need to worry about variables that go into crafting the perfect cup or learning a pouring technique. Most people prefer to use a blade grinder or purchase pre-ground coffee, both to the detriment of flavor. However, having a brewer with a built-in grinder makes everything much easier. There is nothing mysterious about making a Breville coffee maker spit out your coffee. All you need to do is pour whole beans into the hopper at the back, water in front, select the number of cups you desire and let it work its magic. With the Breville coffee maker, users have the option of choosing the coffee strength on a scale of one to eight. This is the amount of coffee for a specific amount of water. After unboxing, you will probably bypass the quick-start guide. The Breville coffee maker is very easy to use. Which is good. Simple is always good. However, to make the grind control feature of the machine sing, you have to know that the goldstone mesh filter that it comes with is not good enough. Getting paper basket filters will be more beneficial unless of course, you want thick, murky coffee. You should also have an idea about how the size of the grind works and why it would need adjusting. This is a good idea since the path to good coffee starts with a great grinder. An essential mechanism that most coffee machines lack is temperature control. It is imperative that you heat water to 200 degrees Fahrenheit to ensure there is proper extraction. The water in the Breville coffee maker heats up incredibly fast. When brewing the display tells you what is taking place (heating, infusion brewing). 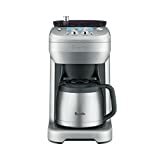 You can set the Breville coffee maker to brew anywhere from two to 12 cups, and there is also a single serving mode that will brew one cup anywhere between 8 ounces to 20 ounces. The single cup mode is useful for churning out close to the selected volume. However, when you choose two to 12 cups, it will measure 5 ounces per cup. Now, for most people, that’s a little bit more than half a cup. Therefore, if you are brewing for four individuals, you might have to select seven cups or more. Breville produces some of the most versatile coffee makers to date. You can brew up to 12 cups of coffee with their coffee makers. Users also have the capability of scheduling their brew with a built-in timer. You also have the option of adjusting your coffee brew strength. So, what are some of the features that stand out? Its stainless-steel burrs design offers wonderful grind consistency during the brew resulting in fresh ground coffee. The integrated burr grinder provides a signature, pure, rich coffee aroma and taste. Users have the option of adjusting the grinder until it is set right for the type of bean you are using. To make that possible the Breville coffee makers have a calibration function. All you need to do is enter the coffee mode desired, and the coffee maker will grind for 10 seconds. You can also weight the grounds and enter it into the coffee maker. It will grind the appropriate amount of time to produce the volume desired. A few Breville coffee makers have this function. Users can brew enough coffee for a full carafe, coffee mug or a travel mug. This feature allows you to adjust the volume anywhere from one to 12 cups. With a Breville coffee maker, users can choose between eight preset strength settings that they desire. The LCD screen makes it easy to read and use the Breville, coffee maker. It also has a programmable clock with an auto start functionality to help schedule brews. Breville coffee maker isn’t a cheap coffee maker by any stretch. A positive aspect about these coffee makers is that they are incredibly versatile, which justifies their high price tags. Some of the cheaper Breville coffee makers that go for under a few hundred dollars include the Breville Precision Brewer Glass and the Breville Precision Brewer Thermal. This is perhaps the most contentious category among reviewers. According to reviews, some users said the coffee produced was too weak for products such as YourBrew. Others said the Breville Precision Thermal produced a brew that was too strong. However, more people said the coffee produced by Breville coffee makers was just right. Very few reviewers found the Breville coffee maker challenging to use. The only problem that was pointed out was, if the coffee maker’s computer malfunctions, there will be no simple back up option to brew the coffee without its bells and whistles. You don’t have to panic, there are very few issues reported about these devices. A single serving of coffee is within the SCAA’s recommendations of two to eight minutes. If you are doing seven minutes, then you are better off doing a pour-over. Brewing 8 cups will take about 6 to 8 minutes, while a full pot (12 cups) will take about 10 to 11 minutes. We did an in-depth, up to date independent research to bring you the most accurate review of the Breville Coffee maker. We went through several Breville Coffee maker reviews, complaints, forums, product descriptions, consumer reviews and many more. Breville manufactures several different types of quality coffee makers. The following a few popular models. The Breville Precision Brewer is not your average drip coffee maker. It does more than just brew big pots of coffee. It brews quicker and with a robust consistency. You can use both flat bottom filters as well as cone filters on the Breville Precision Brewer. Users have the option of customizing key brew factors too. The Breville Precision brewer lets you control the water temperature, length of pre-soak and the flow rate. You also have the option of making a cold brew without making a mess. The Breville precision brewer still shares the same basic shape of other premium coffee makers. Just like its competitors like the Technivorm Moccamaster and Bonavita Connoisseur, the Breville Precision brewer sits on a long narrow base. This brewer comes with a cone filter adapter, a flat bottom metal filter and filter basket. The Breville Precision Brewer scores a cool 4.0 out of 5 stars based on consumer reviews on Amazon. This is one coffee maker that is set to make your life very easy. Simply put, the Grind Control coffee maker has an inbuilt, and adjustable burr grinder. With this coffee maker, you do not need to learn different skills or buy multiple machines to make your coffee. It works perfectly and is more than able to meet every coffee lover’s needs. This coffee maker has a futuristic, curvy metallic appearance. It comes with a removable drip tray that makes it a good fit for travel mugs. It’s also fitted with an LCD screen that provides feedback about the brew time and grinding size. Some of the few setbacks of the Breville Grind Control is that it has a slow brewing process. It’s also a bit on the higher side when it comes to price. The Breville Grind Control costs between $250 and $290. It as a 3.3 out of 5 stars rating based on customer reviews on Amazon. 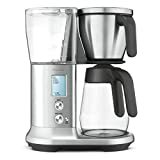 Breville describes the Breville Precision Brewer Glass coffee maker as the world’s first 60 ounce drip coffee maker. This Breville coffee maker has the capability of making brew craft filter coffee automatically. You don’t need to have coffee brewing skills to whip out fantastic coffee. This coffee maker comes with six unique preset modes which include, Gold, fast, Cold Brew, Iced, and MyBrew. Users have the option of finetuning their taste by adjusting the bloom time, brew temperature and flow rate. To enjoy excellent tasting coffee, you need to have precise temperature control, contact time and flow rate. Fortunately, this Breville coffee maker offers these functions. The PID control lets users adjust the accurate digital temperature control. The Pump control selects three different flow rate types to optimize contact time. Lastly, the Thermo-Coil Heating system delivers water that is purer, which in effect brews fantastic quality coffee. The Breville Precision Brewer Glass has an impressive 4.3 out of 5 stars based on consumer reviews on Amazon. The beginning of every coffee brewers journey usually starts with the perfect entry-level coffee machine. Getting a coffee maker in an increasingly competitive market is not an easy task. That is why we have compiled the following list to help compare Breville coffee makers against their competition. The Technnivorm KB741 offers a simple to operate the brewing experience that has the capability of producing a full carafe in four to six minutes. It heats up water quickly using its unique copper boiling element that is capable of maintaining temperatures between 190-degrees and 210-degree Fahrenheit. Its cone-shaped brew basket makes for a six-minute steep to perfectly saturate your grounds extracting the full complexity, aroma, and flavor from your coffee. It also has an accurate pulse action pre-immersion drip system that produces a flawless coffee brew. In about 6 minutes, Technnivorm KB741 coffee maker can brew up to 38 ounces of coffee grounds. Its built-in hot plate has the capability of holding temperatures of 170 or 190-degrees Fahrenheit depending on your preference. It will shut off after 99 minutes automatically. The Technnivorm KB741 has a cool 4.2 out of 5 stars based on customer reviews. Has a brew stop functionality that automatically shuts of brewing when the glass carafe is removed. It has an industrial design that might not fit in most kitchen design aesthetic. The previous version of this coffee maker had an issue with its pod system. It was geared towards providing smaller shots of coffee. However, this new coffee maker has a different coffee pod and centrifugal brewing system. It is designed to deliver richer, longer drinks. Its exterior has the looks of a traditional Nespresso machine. Its 1.7-liter water tank is far much larger than previous models from the manufacturer. It was designed to be large to hold between 40ml and 414ml of coffee. This model also has a smaller Vertuo machine that has a 1.2-liter tank in case you do not have enough room for a bigger machine. Just like any other Nespresso machine, all you need to is pick up the container and fill it from the top, then put it back in place. The Nespresso Vertuoplus coffee maker looks great, is robust and sensibly designed. The Nespresso Vertuoplus coffee maker costs between $170 and $210. It has a 3.7 out 5 stars rating based on consumer reviews on Amazon. 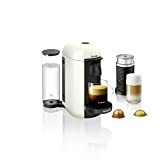 MULTIFUNCTIONAL Super-automatic espresso coffee machine with a patented AUTOMATIC CAPPUCCINO system that delivers a tasty barista-quality Cappuccino, Caffelatte, Latte Macchiato, frothed or hot Milk, Chocolate in less than 3 minutes. Can be used with either coffee beans or ground coffee for preparation of two cups of coffee within a single brewing cycle. USER FRIENDLY. A super-automatic espresso maker can deliver the coffee shop experience to the comfort of your home, any time you feel the urge. System equipped with a sensor metal touch control panel, a front-loading water tank, a frothing unit, a telescoping spigot, a bean hopper & coffee-grounds container with a capacity indicator and also provides adjustable water, milk & coffee drink quantity. The De’Longhi PrimaDonna Elite is perhaps the smartest coffee machine in the market currently. Apart from offering auto preparation of milky drinks and bean-to-cup coffee delivery, this coffee maker will integrate with your phone and let you design your drinks remotely. It’s one of the few models of coffee makers that offers such fine-tuning control on what drinks to prepare. The De’Longhi PrimaDonna Elite is designed to resemble a silver tower. This coffee maker has one of the largest displays ever built in a coffee maker. It's huge, giving the impression that it is as much as a coffee computer as your ordinary coffee machine. Unlike your typical coffee maker, the De’Longhi PrimaDonna Elite doesn’t use physical buttons beyond power-up. All other elements of operations are run through its touchscreen or via your mobile app. You can even turn on this coffee maker with your phone. It has a variety of preset modes for your favorite drinks including long coffees, lattes, and cappuccinos. All you need to do is swipe across its display to browse through them. The De’Longhi PrimaDonna Elite coffee maker has a 4.0 out 5 stars rating based on consumer reviews. 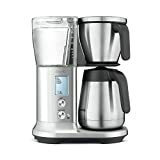 If you are looking for a coffee m​​aker that gives you the freedom to control the most minute details, then the Breville coffee maker is undoubtedly an excellent option. You will be getting the sophistication of an advanced system, with the convenience of a drip coffee maker. These coffee makers offer precise brewing temperatures that make a huge difference when it comes to making great coffee.